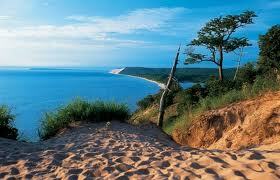 There is a special place in Michigan not frequented by many people that is quite spectacular and breathtaking. When properly positioned for the view, one realizes the beauty demands a silent contemplation for quite a time to absorb what lies before. A panoramic view from a high vantage point includes a vast shoreline hundreds of feet wide reaching for miles north and south, below Lake Michigan stretches to the horizon colored in deep blue to a turquoise shade along the sugar sand beaches on a fine day. Looking north, the Manitou Islands appear set perfectly in the water. Best of all, the white sand dunes called the sleeping bear are seen in the distance, jutting up hundreds of feet out of the water and in contrast to the greenery to the side. This is the beauty of creation for all to enjoy, sinners and saints, true believers to atheists. Alone in thought, this is a great place to think of great things that transform life such as forgiveness. It is hard for us to truly forgive. To forgive takes time, perhaps even years. Emotions play a huge role in the transition from anger or resentment to acceptance of the simple statement “I’m sorry”. Barbara Walters asked Hillary Clinton recently what her reaction to her husband’s scandalous sexual behavior was and if it remains a problem. Hillary responded that his behavior made her furious and yet she continued to know that Bill loved her as every encounter included “ I’m sorry” over and over. Total forgiveness might be possible but is total trust possible again? This process of forgiveness is something all of us can relate to as humans. The hard thing to understand is how differently God treats us. God gives unlimited forgiveness unconditionally. All goodness is from God. The unbelievable reality is that God loves us knowing what we will do to offend Him. His arms are open to all who want His friendship and will follow the light that is Christ. Like the spectacle of overpowering grandeur, forgiveness is a gift for all who seek and accept the miracle of god’s plan for all of creation. The scene described above takes some effort to arrive at the perfect vantage point. One must go to an out of the way parking area and walk down a narrow path through the woods for one mile. Then follow a sand trail up a rise to the crest of a dune and clamber across the peak at an uneasy angle to reach the perfect vantage point. In a sense, it is like reaching out for a beautiful gift and know that it must be highly desired and will not be forced upon us .We must make a choice that is marked by a repentant heart.